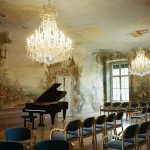 'The conditions for students at the European Music Institute Vienna are perfect for intensive work with professors and for individual practice. At Schloss Laudon you can not only find solitude for creative contemplation, but also relax in the open air. All participants have the opportunity to present themselves at a final concert during the course, which is also important. Registrations received after June 01, 2019 will only be considered in case of free spots. For registration process, select your course, there scroll down and follow the instructions. Note: all instrumental courses are also open for chamber music ensembles.